The company's earnings report shows that shale is becoming increasingly important to the company's future. With each passing quarter, Chevron (NYSE:CVX) continues to benefit from, and become more dependent upon, its booming shale-drilling business in the Permian Basin. 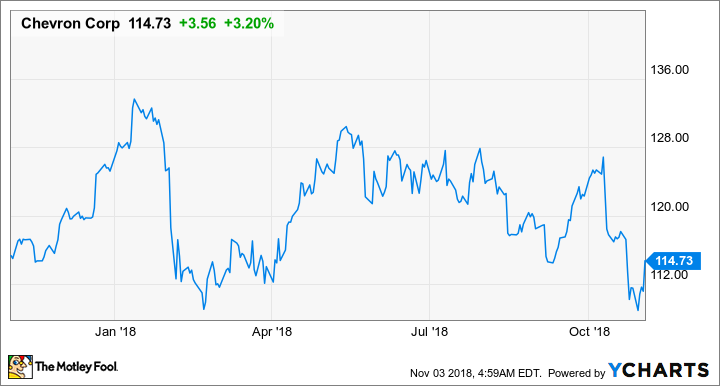 The company is getting much better results than expected from its drilling program there and is generating lots of excess cash flow to reward investors with share repurchases and dividends. What's even more fascinating about Chevron's strategic plan is that it's also selling assets and keeping capital spending at incredibly low levels. Is the company banking its entire future on shale, or are there other plans in the works? Let's take a look at Chevron's most recent earnings results and see what management was up to this past quarter. DATA SOURCE: CHEVRON EARNINGS RELEASE. EPS= EARNINGS PER SHARE. Chevron's exploration and production business continues to be the driving force for the company's earnings results, as the company generated more than 83% of its earnings from production. The one thing that stands out in these numbers more than anything else is the decline in international downstream operations, as its earnings were down close to 50% from last year. That's because the company benefited from the sale of its Canadian refining assets this time last year. Chevron also netted a one-time gain of $350 million on the sale of its southern Africa refining, marketing, and lubricant business. Data source: Chevron. Chart by author. Chevron's total production for the quarter came in at 2.96 million barrels of oil equivalent per day, up an impressive 8.8% from this time last year. That production increase even included the effects of maintenance shut-ins and asset sales. The driving force for the production gains is from continued ramp-ups at its Gorgon and Wheatstone LNG facilities in Australia and higher production from its shale assets in the Permian Basin. Speaking of the Permian, total production there increased 80% year over year to 338,000 barrels of oil equivalent per day. which is more than 100,000 barrels per day higher than management's guidance it set back in March. According to management, it's one year ahead of schedule in its Permian operations and doesn't see a significant slowdown starting any time soon. The company announced it had completed the sale of its southern African refining and marketing assets to Glencore and announced it was selling North Sea assets and says it continues to look for buyers for its Central UK North Sea assets. So far, the company has sold $1.9 billion in assets in 2018 and says it's on track for $5 billion to $10 billion in asset sales between 2018 and 2020. As part of its share repurchase authorization program, management bought back about $750 million in shares this past quarter. It also had enough free cash flow in the quarter that it was able to pay down about $2.4 billion in debt. Excluding the impact of asset sales, production growth is currently at 6% relative to full-year 2017 and we expect to end the year closer to a 7% year-on-year increase. Our Permian assets are performing well ahead of guidance. We've had a very solid operating and financial performance so far in 2018, and we expect that performance to continue. We're seeing significant growth in cash generation due to the above-planned production growth, continuing capital and operating expense discipline, and favorable market conditions. As a result, we've been able to grow shareholder distributions and strengthen our balance sheet. We believe that Chevron offers a very attractive offering for investors with oil price levered momentum in the upcycle and low-cost portfolio resilience in the downcycle. You can read a full transcript of Chevron's conference call. Can Chevron maintain this strategy for much longer? With more asset sales in the works and no recent announcements for new major capital projects, Chevron is increasingly depending on its Permian Basin assets to fuel growth for the next several years. So far, that plan is working, because production from the region is growing way faster than management's initial expectations. Getting more out of the Permian without having to increase its capital budget is a large reason the company is throwing off so much cash right now and able to buy back billions in shares. Investors have to wonder, though, how much longer this will be the status quo. Outside the Permian, its project hopper looks rather small, and it continues to shed downstream assets. Eventually, the company will have to start spending on new developments again. When that happens is anyone's guess, but we'll probably get an update in March at its annual security analyst meeting.